Everyone is all hyped up about Fate/Zero nowadays and with good reason. Fate/Zero is simply that good! No, really. In my honest opinion, it is simply one of the best anime series to date. The hour-long first episode sets the audience’s expectations just right for the epic plot-driven story that is to follow while also showcasing Fate/Zero’s vast array of characters and their particular motivations for participating in the war of the holy grail. Also, did you notice? Not a single battle scene in that ep, just lots and lots of talking. Was it epic? Definitely! Was it boring? You must have a bad case of ADD. Go see a shrink immediately, man! You got issues. Hey, guess what? Unlike every other Benasu-ridden (a little term that FIA, a friend of mine, coined for people who follow the author of Tsukihime and Fate/Stay Night, Kinoko Nasu like a god.) fan out there, I used to not like Fate/Stay Night very much. I mean, the anime adaptation was ok, but it was just every other shounen anime ever released. There was nothing special about it; the characters were bland archetypes and the only high point in the series came in episode 7 with GaaaRcher’s famous (infamous?) last stand against Berserker. Of course, my view gradually began to change when I actually sat down to read up on all three paths of the visual novel that inspired the anime. It was good, I have to give it that much. Just like every other person who’s read Fate/Stay Night, I felt that the UBW (Unlimited Blade Works) arc was the most enthralling. I particularly enjoyed the protagonist’s transformation with Archer as the cynical foil to Shirou’s more untainted, straightforward personality. Still, I felt that despite the apparent “depth” of the novel that Benasu-ridden fans like to harp about, that Fate/Stay Night was just an average shounen story with a lot of emphasis on Nasu’s trademark repetitive, superfluous narrative style (this chair! this chair! this chair! this chair! this chair! this chair! Anyone?. I’ve been told that this style is unusual even in native Japanese, but hey, I’m no l337 JLPT over 9000 person, so you’ll have to take my word for it or ask your friend who is looking over your shoulder face-palming at this paragraph at this very moment. Anyway, enough about the novel. If you’ve only seen the anime, then you’d probably say something like “it was good… not that good.” Yeah, that about sums it up, right? Now in Fate Zero, hohoho! Now this is an anime – no, in fact, this is THE anime of 2011. Oh sure, it’s not gonna be finished until sometime in 2012 and there are/have been better anime out there in other or similar genres, but what is undeniable about Fate/Zero is that it makes its older sequel, Fate/Stay Night, pale terribly in comparison to it. There are dozens of reasons for this if you follow the discussions in the fanbase. Some say it’s because Urobochi Gen’s (author of the Fate/Zero light novel) writing is so much easier to adapt to animation and some say it’s the way the animation studios handled the execution, others say it’s coz Iskander is stealing the show at the moment, which he is – but let’s not talk about those things today mmkay? See, I like to judge things based on how they are presented to me and not based on their background, history or whether the producers were busy PROfessionally creating something else at the time the anime was being made. 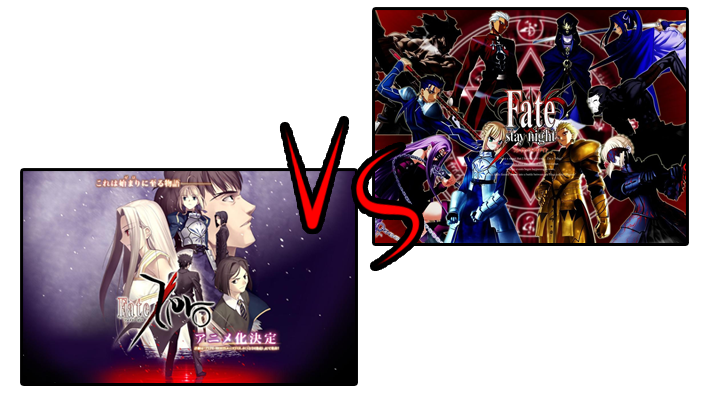 Here’s the lowdown as to Fate/Stay Night vs Fate/Zero. Fate/Zero actually makes you WANT to care about every single one of its characters while surreptitiously advancing the plot in the background. Although I said that the story is mostly plot-driven, the characters and their particular backgrounds and personality quirks are so deeply interwoven into the story and into each episode that you rarely feel like you’re just reading some kid’s sappy fanfiction about cooking breakfast, lunch and dinner – which incidentally, is exactly how Fate/Stay night reads at many points throughout its three epic arcs. Fate/Zero is the story of different masters, servants and the people around them who have somehow been involved in the holy grail war. It doesn’t waste time telling you about how epic its universe is or how awesome the holy grail is going to be and that it’s angry mayu and every other nasuverse crap you can spout; instead, Fate/Zero focuses on kinetic, action-packed storytelling and intriguing characters. Even Saber who was totally boring in Fate/Stay Night shines thanks to her interactions with the characters of Fate/Zero. In short, every character is important to the plot in Fate/Zero but none of them may be considered as indispensable. This adds some real tension to the story and makes you really experience just how grand the entire Holy Grail war really is. In contrast, Fate/Stay Night is the story of a single person, Emiya Shirou. Everything that happens in the plot revolves around Shirou. Whether the story is making him out to be some kind of human failure (hello, Zerozaki) or an awesome hero who is made of swordz, or making out with Rin and Saber, the world of Fate/Stay Night basically comes to a sudden stop without Emiya Shirou. It doesn’t feel as epic as it wants to be simply because the hero, Emiya Shirou is simply far too important, too much of a central figure in the grand scheme of the nasuverse for anyone to care much about anyone else. Oh sure, there are some of you guys out there who have been going, “Rin is my waifu” since time immemorial or something to that effect, but you get what I’m saying. Fate/Stay Night doesn’t allow its readers/viewers to experience the awesome-ness of the Holy Grail war because the author would rather spend time telling everyone about the intricacies of the nasuverse rather than actively moving the plot forward. Hmm… so in conclusion, what can I say about Fate/Zero vs Fate/Stay Night that hasn’t already been stated better in many pseudo-intellectual forum discussions and articles before this? Well, nothing really. I guess I’ll just agree with the fanbase and say that Urobochi Gen totally curbstomps Kinoko Nasu in the storytelling department – nuff said. Doing a Let's Read of Hierofania, a visual novel recommended by a friend.Seems quite nice so far. I'll just give my impressions as I do this playthrough. One of the first games I ever had for my PS1. Still a pretty decent game as far as graphics and gameplay are concerned even by today's standards. I'm playing through story mode in this playthrough. This is a review and read-through of a visual novel that I had a small hand in bringing to completion. This review is merely copypasta of the same one I posted at the teacup and is addressed to the author. I really liked how the opening and ending subtly tie in with each other, especially the metaphorical use of the bubbles without the narrator explicitly stating anything -- which would have been quite out of character and furthermore, I believe that explicit storytelling (E.G. I shot an arrow into the air. This arrow was the symbol of how our love for each other would soar powerfully, not to mention gracefully, throughout the heavens and then unceremoniously come to an abrupt halt once it hits something or if it runs out of momentum. This is how our love works.) is tantamount to spoonfeeding and therefore underestimating the reader. The writing was solid and the dialogue flowed quite naturally between the two characters. The narrator-protagonist is an excellent foil for Dewi's stronger, whimsical personality as opposed to his self-deprecating, almost apathetic persona - that is, if his narration is to be taken honestly, since he has demonstrated a tendency to lie in order to prevent conflict with Dewi - which doesn't really save him from getting punched err... I mean, "playfully jabbed" a lot. The weakest point of the story would be the theater scenes, wherein I felt the characters didn't really have any reason to be there and the dialogue between them felt a bit awkward. The lack of music during this scene might have also colored my perceptions. The Brutally-Honest-To-Goodness-Hammer-And-Nail-To-Your-Face-Holy-Sanctimonious-Slightly-Sacrilegious-Spoilerific-Effin CRITIQUE ... to help you improve. All lines below this one are to be taken with a grain of salt... to help you improve. I will try to point out some of the negatives that I found in this VN... to help you improve. Of course, my critiques are generally quite opinionated, but I hope you still find them useful... to help you improve. While the piece works well enough for me as a dialogue-driven short kinetic novel, I did feel that it could have been much more than what it currently is as far as the emotional involvement of the reader in the piece is concerned. I like the slice-of-life feel of "Of Love and You" and I understand that it doesn't want to be a "masterful work of staggering genius," but what I felt was lacking was a solid plot. The back-and-forth conversations between Dewi and the protagonist, while entertaining on their own, do not seem to serve any deeper purpose than characterization. I might have missed it, but I feel it would have been better if the dialogue as well as the narration were being used to slowly work towards the eventual conclusion in the ending. I didn't see this happening in "Of Love and You" and thus, while the beginning and the ending were quite well-made, the meat of the VN, the middle portion felt slightly detached from the intro and end. I short, it doesn't seem like the middle portion was moving towards the ending. One thing that I believe could have helped out is foreshadowing. The visit to Dewi's house could have been foreshadowed via a casual conversation between the two characters while they were still blowing bubbles in the field or anywhere else prior to the actual house visit for that matter. Other elements such as the bottle that Dewi used to blow bubbles could have been subtly given some significance in the intro or middle portions in order to give them the impression of having some significant role in the ending. Of course, this is how I'd personally handle foreshadowing and I'm sure you have some ideas of your own. In any case, I just didn't see them being put to use in "Of Love and You." Finally, I think some sort of climax scene could have made the VN more emotionally-engaging. You could have used a simple plot device such as the protagonist revealing something about his past to the audience near the end of the story just as they come out of the house to start blowing bubbles again, which makes the act of blowing bubbles or spending time with Dewi just that much more significant. There are a number of ways this could have been done from the tired cliche of "I have a terminal illness" to "she used to be a drug addict" or something like "I was once suicidal until I met Dewi." Of course, over-all, the VN works for what you intended it to do as a dialogue-driven VN that makes the reader think about the relationship of Dewi and the protagonist. A belated congratulations on the release and I know you are capable of doing better and even more enjoyable stories in the future.